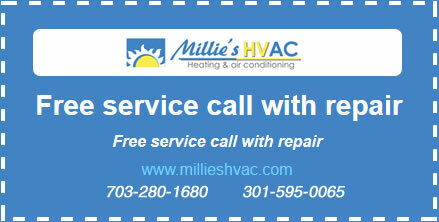 Millie’s Heating & Air Conditioning offers a full range of Arlington, VA air conditioning repair services to customers throughout the area. Our qualified HVAC technicians are trained to service all makes and models, and we specialize in Amana and Carrier AC services. Whether it’s an emergency repair or your system is not working properly, call the expert technicians at Millie’s HVAC. Customers throughout the area have trusted our services since 1985. Call today to find out why we are one of the leading air conditioning repair companies in Northern Virginia. Any air conditioning system can have problems or break down unexpectedly, so that’s why we offer same day service for emergency repairs. If you notice that your air conditioner is not cooling your home as it normally does, or if there are inconsistent temperatures throughout your home, give Millie’s HVAC a call. We provide our customers with prompt and reliable services, and when you sign up for our maintenance programs, you get priority service, every time. Our technicians are trained and ready to prepare all types of air conditioners and supporting equipment, so call now for any emergency repair need. We’ll get your system running again in no time. When you call us to fix a broken air conditioning system, we will not only resolve the issue, but we will also check other components and test the entire system to ensure that everything is working properly. We’ll then test the efficiency to make sure it is running at optimal levels. We can also go over your options if your AC system needs any replacement parts or major repairs. In some cases, you may choose to replace your air conditioner due to costly or frequent repair needs. Some older, inefficient models may also be costing you more in energy bills, in addition to other repair costs. Deciding whether to replace or repair an air conditioner really depends on the situation. Every situation is different, and every homeowner has different needs and budgets. Our technicians always give our customers an honest evaluation of any HVAC equipment. We only hire experienced technicians who are drug tested and background screened. That means you know you are getting trustworthy air conditioning services backed by the NATE standards of competence and integrity. If you want service you can trust, call us first. The NATE–certified repair technicians at Millie’s HVAC know that your time is valuable, and that’s why we make sure to get the job done right the first time, every time. When you need an air conditioning repair in Arlington, VA or the surrounding area, call Millie’s Heating & Air Conditioning. We guarantee that you’ll be satisfied with every service we provide. Call now!